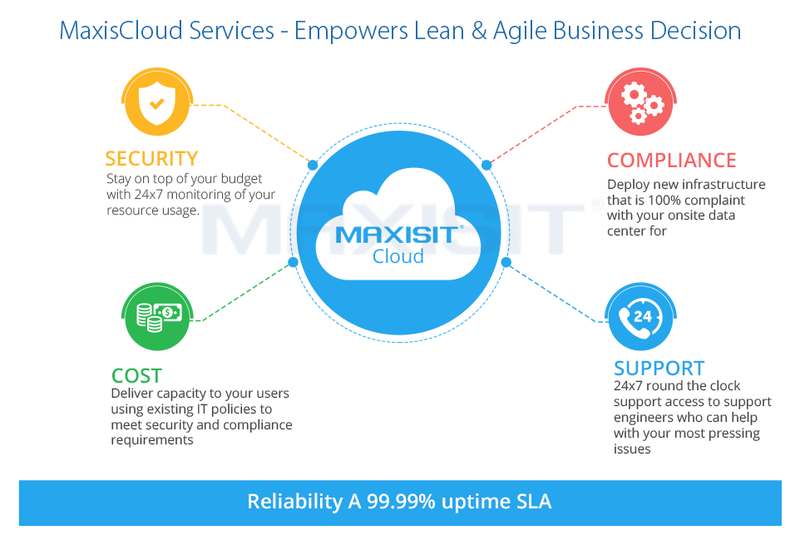 MaxisCloud™ Services offers a holistic cloud solution for a lean and the agile business environment for Healthcare. Our regulatory compliant, cloud services setup reduces IT complexity and cost of maintaining and deploying resources. MaxisCloud™ is setup on VMware vCloud Director with creation of Organization Virtual Datacenter, Virtual Private Network, Creating Catalogs, Creating Dedicated Data store and Configuring vApps. It incorporates high availability features including automated failover of instances, fully redundant host, network, storage hardware, and enterprise class Storage Area Networks to increase performance and reliability. Create a new organization, users networks, virtual data centers, and catalogs. MaxisCloud™ allows setting up a recurring chargeback report so the tenant can be billed, and also sends an email notification to the tenant advising them that their new cloud environment is ready. Our vCloud Connector Services (vCC) solves the problem of migration by allowing you to perform migrations from all of your public and private clouds and obtain a consistent view of them from a single interface. Installed by cloud administrators, it can be used by administrators and end users alike to manage workloads. Private Cloud: Private clouds are dedicated to a customer for private use and can be built and managed within MaxisCloud™. Hybrid Cloud: Hybrid clouds blend the benefits of public and private clouds by enabling customers to retain confidential information in a private cloud while providing access to the wider choice of applications available in public clouds. Community Cloud: Community clouds are collaborative resources shared by a number of organizations, perhaps in the same industry, with common interests.